I’m in total denial about summer winding down. Gulp. You too? Many of you have been writing me asking about healthy, on-the-go snack recipes for back to school, work, or simply a busier season ahead. Even if I can’t get behind summer drawing to a close, I can definitely get behind whipping up some snack recipes to have on hand. 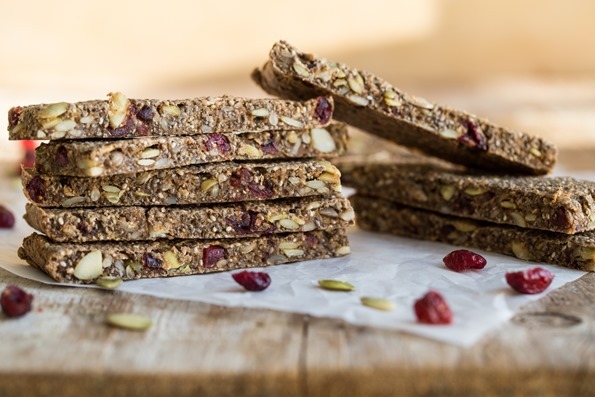 I put together this round-up of 21 favourites from granola bars to energizing grain-free crackers and everything in between. I plan on stocking the freezer as soon our kitchen is back in order. All of the recipes below are vegan and gluten-free (most are soy-free too), and the majority can be made peanut or completely nut-free to make them school-friendly – be sure to see my allergy info/notes/substitution suggestions for each! I’m a big fan of recipes that can be customized many different ways. I hope this post helps you discover a few goodies to ring in the upcoming season! If you haven’t already, don’t forget to check out my post on 21 Vegan Freezer-Friendly Meals. 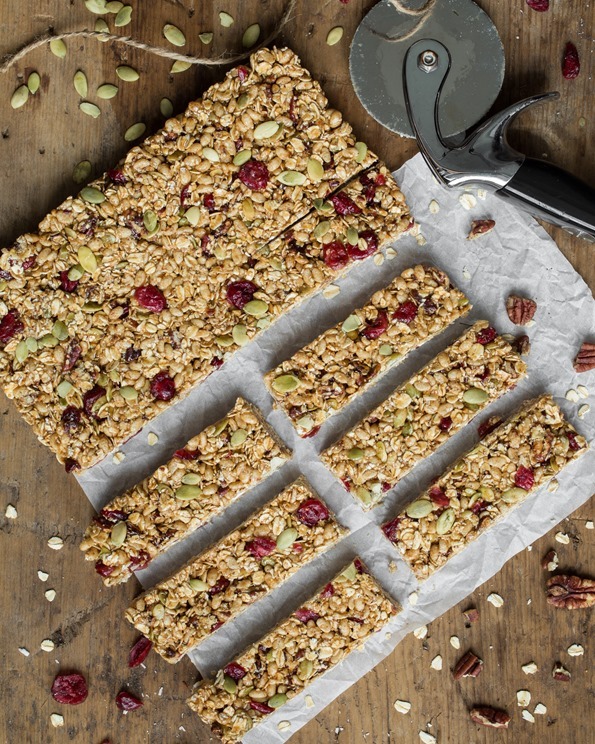 Hearty, chewy, and crunchy, these wholesome granola bars will fill up the tank and keep your energy stable. Make it nut-free: Swap the almonds and walnuts for more sunflower, pepita, and hemp seeds. 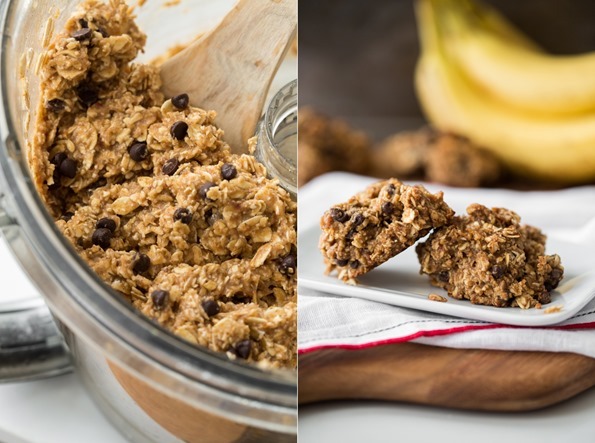 My favourite way to use up ripe bananas! Ultra dense and chewy, these banana bread muffin tops make a great running-out-the-door breakfast or snack. 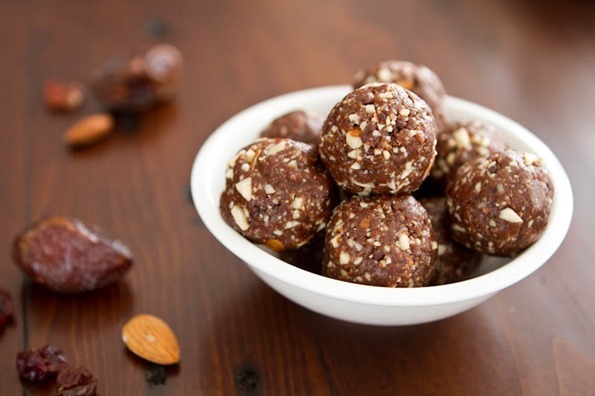 Sweetened with banana and dates, there are no added sugars if you swap the chocolate chips for walnuts. 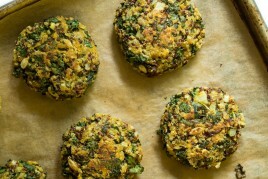 Try them warm served with a pat of vegan butter, nut/seed butter, or coconut oil. These lightly sweet pumpkin gingerbread snack bars are dense, chewy, and filling! Try them topped with my creamy cashew butter maple cinnamon glaze, or enjoy them plain or spread with pumpkin butter. Make it nut-free: Omit the cashew butter glaze or swap it for a simple icing sugar glaze. 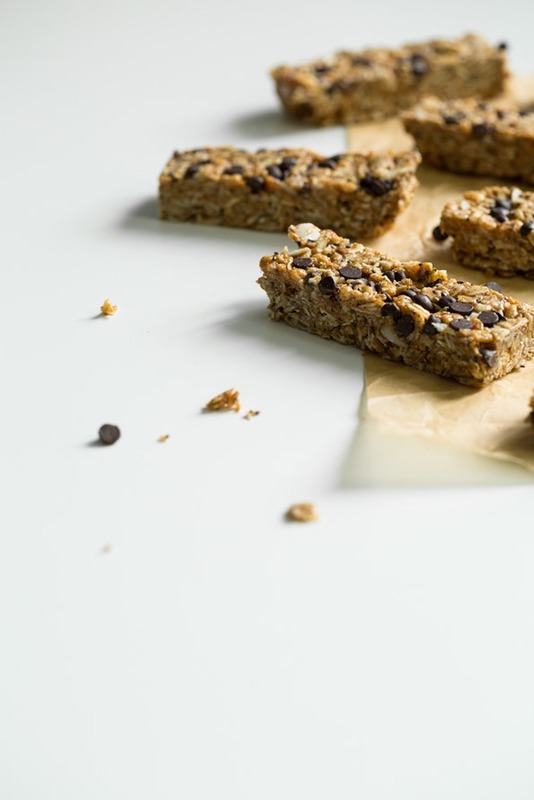 These no-bake bars are thrown together in minutes and make the perfect snack to store in the freezer for a quick burst of energy. I used an unsweetened/unflavoured protein powder, so if you are using a sweetened protein powder, you will likely have to reduce the liquid sweetener (and make up for the lack of liquid by adding some non-dairy milk). Play around with it if necessary and aim for a cookie dough texture. You can also roll the dough into balls and add in chocolate chips if you don’t wish to make them into bar form. 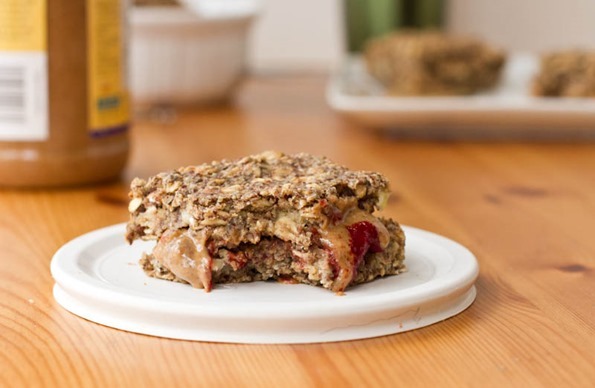 Make it nut-free: Swap the nut butter for sunflower seed butter. 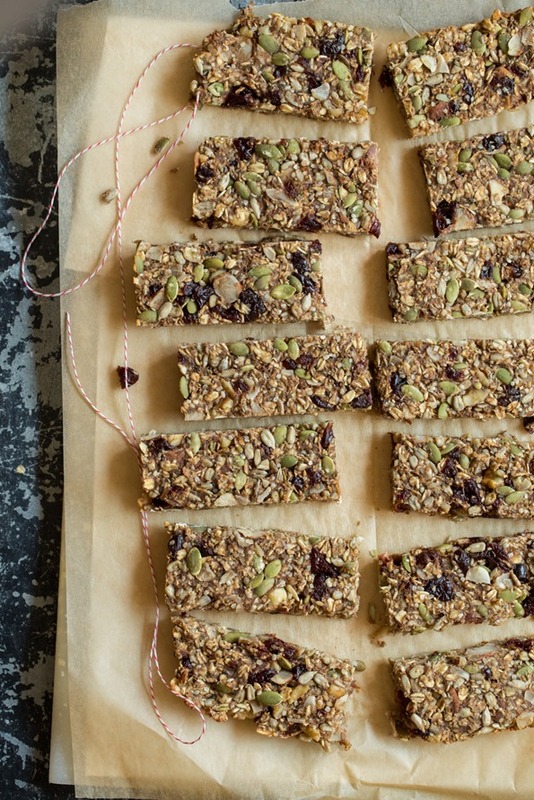 Easy no-bake granola bars inspired by the popular Almond Joy Chocolate bar flavour. 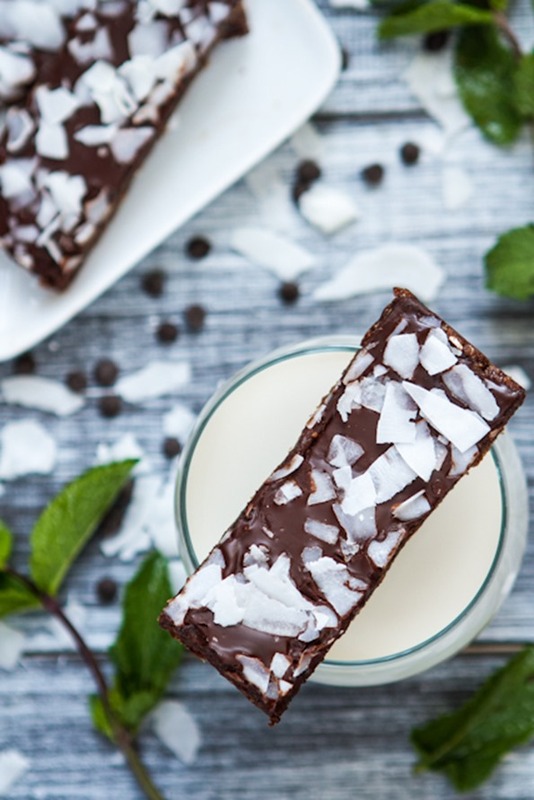 Roasted almond butter, mini chocolate chips, and coconut unite to create one tasty bar that’s whipped up in 10 minutes (no oven required!). Make it nut-free: Swap the almond butter for sunflower seed butter and swap the almonds for sunflower seeds. Five-ingredient homemade cookie dough “Larabar” knockoffs at a fraction of the price! What could be better? No-bake chocolate bars that taste just like a chocolate covered peppermint patty! 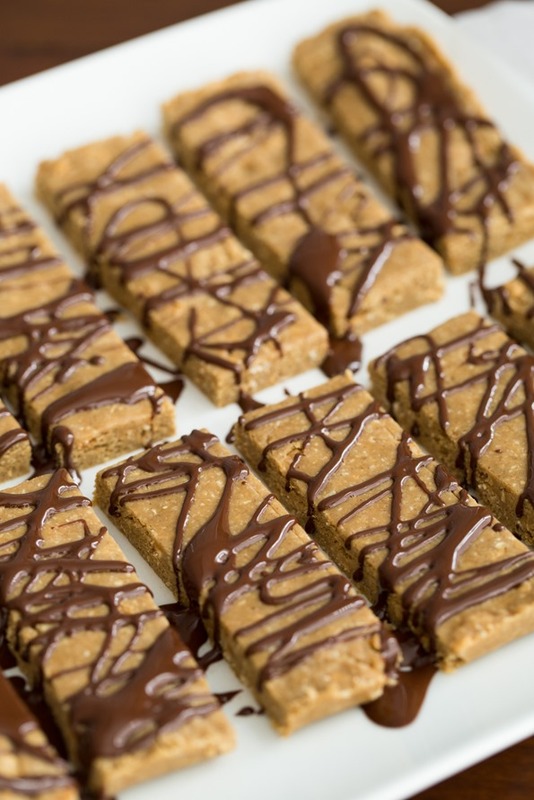 Be sure to see my Naturally Sweetened Peppermint Patty Bars as well. 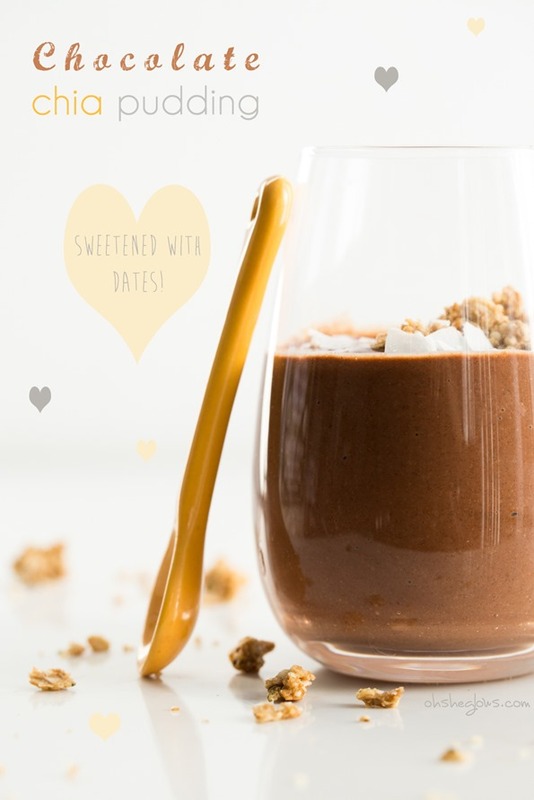 A totally nut-free and refined sugar-free chocolate protein bite! Ready in minutes. 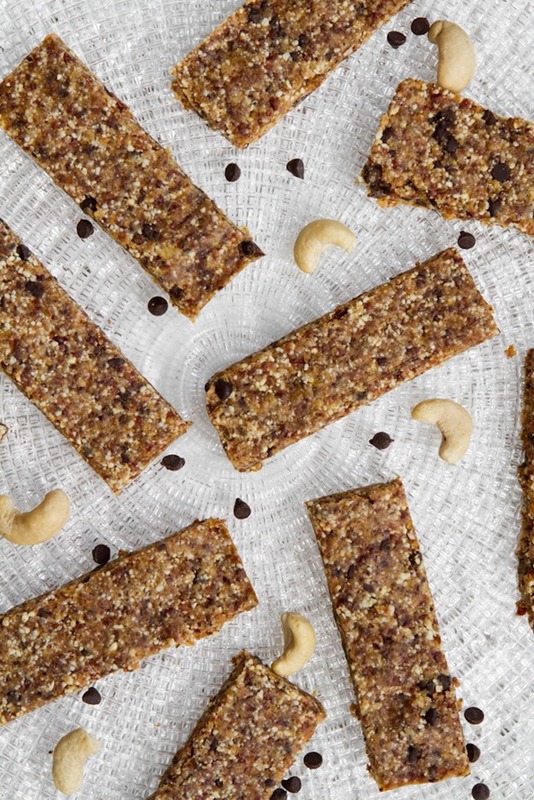 These energy bites are inspired by Larabar’s Chocolate Chip Cherry Torte flavour. I prefer to roll them into bite sized balls rather than bars because it’s fast, but shape them however you wish. This chocolate chia pudding is decadent-tasting yet healthy at the same time. Packed with protein, fibre, and omega-3 fatty acids this is a pudding you can feel good about! When blended with the almond milk ice cubes it’s a treat you can enjoy immediately without waiting for it to chill. The texture is a cross between a smoothie and a pudding. It will thicken up even more if you put it in the fridge for a few hours. I recommend using a high-speed blender for best results since the dates, chia seeds, and ice cubes are challenging to blend super smooth. Make it nut-free: Swap the almond milk and almond milk ice cubes for a nut-free non-dairy milk of your choice (coconut milk would be nice). 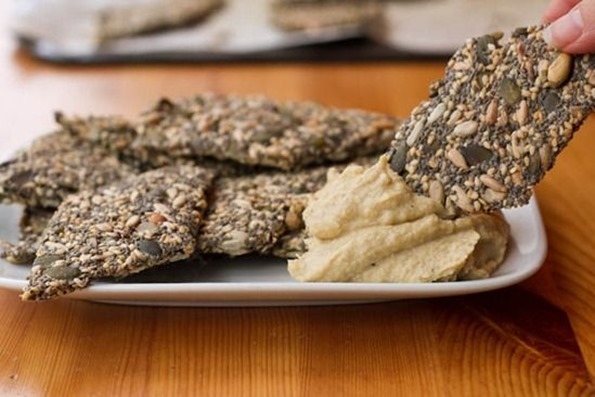 These Endurance Crackers are extremely light and crispy while providing long-lasting energy. Feel free to change up the seasonings and spices as you wish. 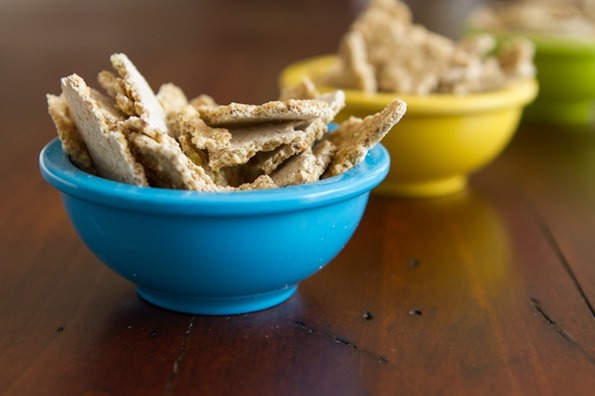 See why they are one of the most popular snack recipes on the blog! Inspired by One Lucky Duck. Enjoy it as a raw cereal with homemade almond milk or just eat it by the handful. Think of this oatmeal square as basic baked oatmeal that can be dressed up any way you like. 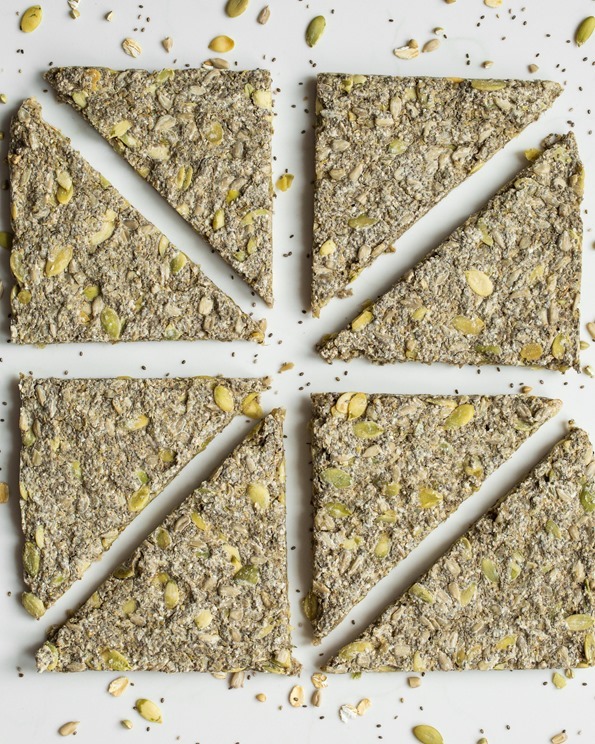 Each large square contains a tablespoon of flax and a teaspoon of chia seeds as well as 7 grams of fibre and 6 grams of protein. Feel free to add in nuts, dried fruit, chocolate, and other mix-ins as you desire. Make it nut-free: Swap the almond milk for a nut-free non-dairy milk (such as coconut milk) and swap the nut butter for sunflower seed butter. 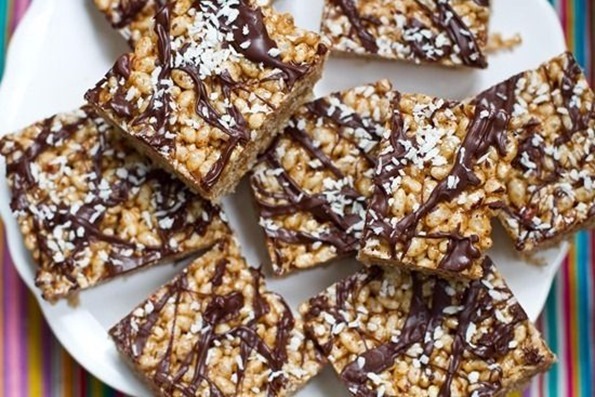 Addictive rice crisp treats – no marshmallows required! Make it nut-free: Swap the almond butter for sunflower seed butter. 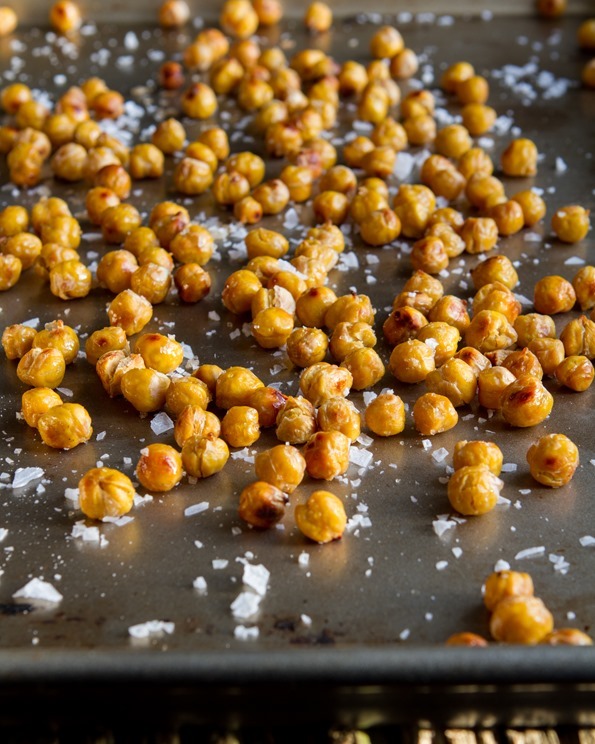 Chickpeas roasted until crunchy in a garlic, cumin, ginger, chili, and turmeric spice mix. Once you pop, you can’t stop! Inspired by my all time favourite chip flavour – salt and vinegar! The secret is infusing the chickpeas in vinegar before baking. You won’t believe how authentic the flavour is. 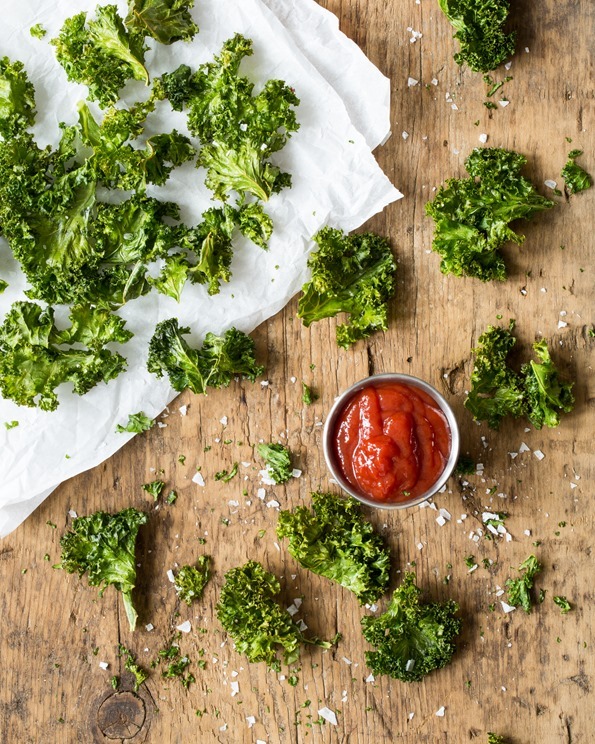 Crispy and chewy kale chips baked in the oven and seasoned to perfection. Enjoy these as a healthy alternative to potato chips. See why this recipe has a 5-star rating! This recipe is proof that not all doughnuts have to be the unhealthy kind! Packed with antioxidants, omega-3 fatty acids, protein, and fibre, these baked doughnuts will have you feeling ready to conquer your day. Filled with cinnamon, dried cranberries, pepita seeds, and toasted pecans, this granola bar gets me excited about the fall season. Ready in 20 minutes, no oven required. Great round up! There were some that I forgot about that I need to put on my “to make” list! I’m glad summer is ending only because I teach college classes and LOVE starting a new term! And marathon training in the Florida heat is horrific. Can’t wait to try out some of these after-school snacks for myself! I think it’s great that you can use snacks for an awesome list like this for your daughter instead of school just giving them goldfish crackers, pretzels and teddy grahams without your knowledge. When my kids get these type of “snacks” (um, more like desserts, right), they just don’t eat lunch!!! My take?!? that they only need so many calories in a day so they no longer need lunch. But fill up on essentially, junk food! bleh. Is it a private school? The public school my kid attends does not allow homemade snacks of any kind in the classroom. Any food they eat in the classroom has to come in a sealed tamper-evident container with an ingredient list. They gave “food allergies” as the reason for this ridiculous rule. Younger children who have snack time in the classroom as part of their every day routine have snacks provided by the school, to be fair to the lower income kids. I generally don’t comment back, but feel the need to here. As a mother of a child with severe allergies, that rule is not ridiculous. One person accidentally getting peanut in the snack they send can mean life or death for some children. If it is important to you that your child not eat what they provide, ask that they not give the provided snack to your child. And you would be surprised what all foods are labeled “May contain peanuts”. Pretty much all raw nuts are processed with peanuts. Even though she can technically have almonds, I can’t find any that aren’t processed in the same facility as peanuts, therefor she cannot have them. I know on your side it seems “ridiculous” or annoying, but if it was your child whose life depended on knowing what was not being consumed, you’d be thankful for those rules. You can’t imagine how terrifying it is just to send your child to school not knowing who is going to touch her after eating a peanut butter sandwich and you have to rely on teachers to make the right call and properly use the epipen. So many great ideas here. Thanks for putting this all together! As much as I’m sad to see another summer go, I am looking forward to fall. I’m ready to see the leaves turn and curl up in cozy sweaters. Plus, it will be a very exciting time for you! I can’t wait to see that precious baby girl. I wouldn’t have thought coconut butter would be “sticky” enough – good to know you’ve had success with it! I can imagine how challenging it is! I warm the coconut butter so that it is liquid and much easier to work with as I make a recipe. I find that once it cools, it adds more structure to the finished product and sets better than if I had used a nut butter. It’s been a very good discovery in our house! 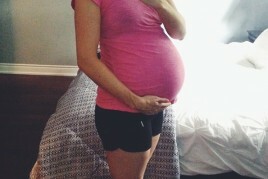 Good luck with the impending arrival of your little baby! These look fab! Can’t wait to make them for school! Any of these freeze well? I’m thinking major batch cooking & freezing to take care of snacks for a month! I would guess that almost everything will freeze well except for maybe the chia pudding (havent tried it, but maybe it does) and kale chips. 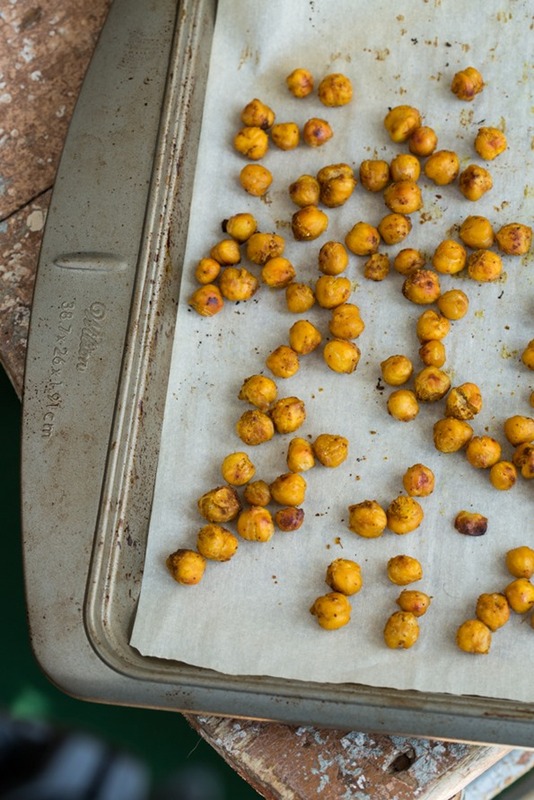 You can even freeze the roasted chickpeas (after cooling) and pop them back in the oven to reheat! So many great recipes here! I’ve already made lots of them, but there are a few gems here I still want to try soon. As much as I don’t want summer to end, I always look forward to the fall around this time of year. Fall farmers markets, county fairs, fall hikes, and of course comfort food… there are so many things to look forward to! Perfect timing! My clients are asking for snack recipes and now I can just give them the link to your blog!! I can’t wait to make them myself :) Thanks Angela! Thank you Angela. I feel some batch cooking is in order. I think I may just go down the list and make everything. Yum!!!! Wow there isn’t one of these I wouldn’t make – yummy! Thank you for this post! My daughter (18) was just asking me if we could make her several healthy snacks to freeze. (From our oh she glows cookbook) She is vegan and wants to be prepared for her senior year! This is perfect! I’ve been doing a lot of homemade crackers lately, will have to give some of yours a try! Those endurance crackers do sound amazing! And Kale Chips – enough said. The best snack ever! 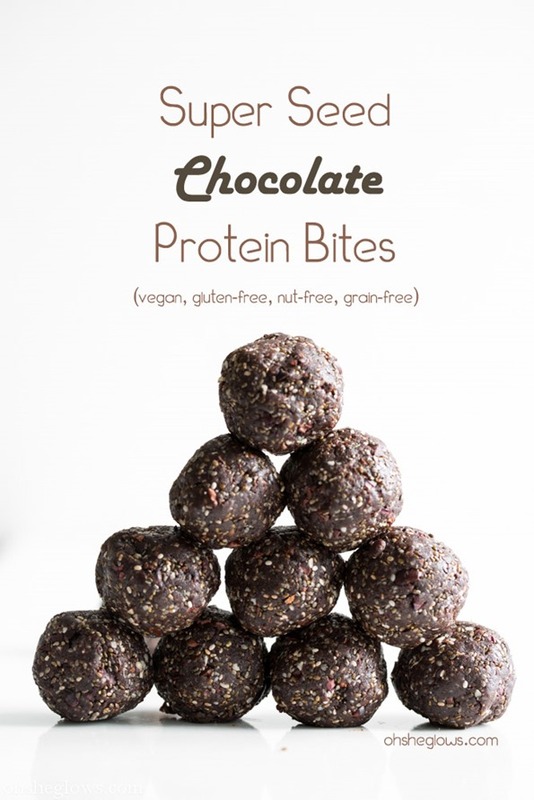 these all look amazing but I will totally be trying the almond joy granola bars … squeelll yummm!!! Thank you for the wonderful snack ideas! Just wondering if you can actually not notice or taste the protein powder in the protein bars. I have not tried this specific brand yet but all the protein powders that I have tried have a stranger aftertaste…. Hi marie, Yes you can taste the protein powder a bit (I use Sunwarrior) – I’ve yet to find one that you can’t taste at all. I am a recent newletter subscriber. I love everything you send out; letters, tips, recipes, videos, etc. I am so forunate to have come across your wealth of knowledge and all the wonderful work you put into each message. Thanks for all you do everyday to inspire vegans and hopefully some non vegans! 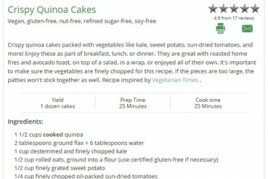 Do you have any nutrional information for the recipes you share? Thanks for the round up! I also have your cookbook and can’t wait to work my way through it :) Are hulled hemp seeds and hemp hearts the same thing? I make so many of your recipes but have not made one with either of those ingredients yet and am trying to figure out the difference betweent the two. 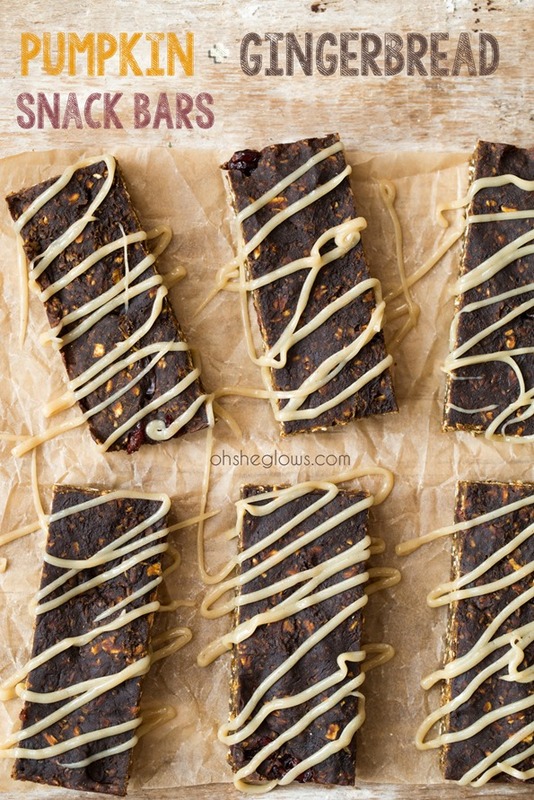 Awesome round up, so much inspiration for healthy snacks! Will have to come back to work my way through the list, I want to try them all!! I have recently become vegetarian. I use your book a lot and I love it! I wonder though how can I find out how many calories in each meal? Angela – Absolutely love your blog and cookbook! I recommend both to every aspiring vegan (and non-vegan) I meet. I have tried to make chia pudding on a number of occasions, and I can’t get the chia seeds to thicken the almond milk. I follow recipes exactly and use only new chia seeds, but I still don’t have any luck. Any idea what I am doing wrong or could do differently? Thanks! Alisa, have you tried different brands of chia seeds? I noticed that some brands thicken better than others. I haven’t. I generally buy chia in bulk from the local specialty shop in my neighborhood. Do you have any recommendations for brands? I’ve had a similar issue before too! I fixed it though by adding in an extra tbsp of chia seeds to the almond milk. It will thicken it right up! Hope this helps! HI Angela! Completely off topics but I’ve been obsessed with your perfected chickpea salad for the last month or so. I went to make it for lunch today and found that I only had mayo and frozen chickpeas. In a pinch, I made a Greek chickpea salad with kalamata olives, sundried tomatoes, fresh tomatoes, oregano, garlic, and mayo (ate it on a corn tortilla since I’m GF). So good! Thanks for being such a great inspiration for a healthy lifestyle! I have been doing the health care concept of vegan foods now for a while and I cant tell people how much better I look and healthier I feel. There is no way eating animal based products is anywhere near that of a vegan’s health. I would love to learn more on foods and recipes that are vegan. I love roundups like these and this is the perfect post for back-to-school snacks. I’m in the process of applying for my doctorate so between that, classes, and life I need all of the quick, healthy, tasty snacks I can get! These all look great, but I am especially excited to try the roasted chickpeas recipe. Chickpeas are the best. Angela – I’m sure you get a ton of requests for stuff like this but I would LOVE if you could make a similar list that compiled recipes good for babies and toddlers – soft foods that are easy for new eaters that are easy to chew and nutritious and unlikely choking hazards. I recently made your oatmeal squares and the texture is perfect for my 16 month old. What a great roundup…will be referencing often! Question: I am about to make the first granola bar recipe, and was wondering if I could substitute buckwheat for the rolled oats? Do you think such a hearty grain (well, grain-like) ingredient cook in the oven at this temp? I also have been meaning to tell you how much I appreciate your flawless recipes…I love that I can trust them to turn out perfectly and your very precise instructions. I’m a pretty experienced cook, but when it comes to baking – that’s a completely different story. Having been a vegan for many years, I’ve collected a large collection of cookbooks, and I can already sense that OSG is sure to be one of those classics, a favorite, that I return to time and time again. They all look so great but the chocolate chia pudding is for sure the winner! I have to make that one! Thanks for sharing so many great tasting and healthy recipes! 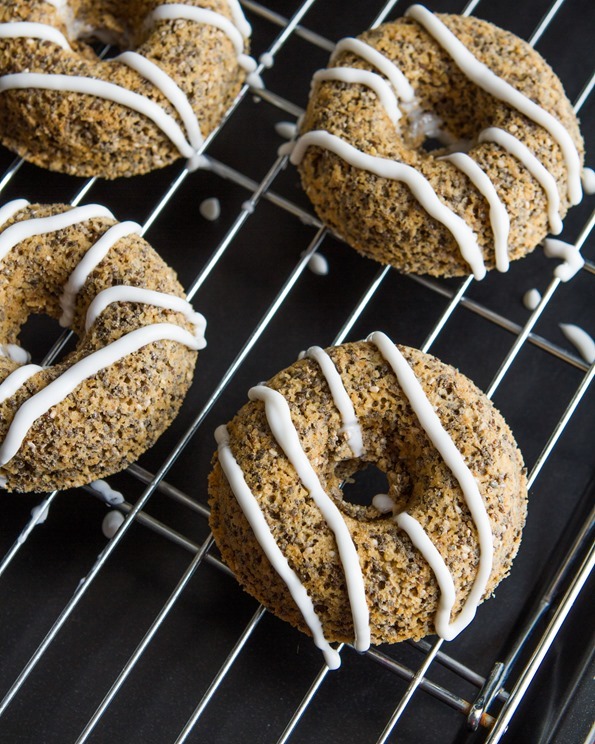 The chia donuts look amazing, and so do the salt and vinegar chickpeas. (Two of my favorite things ever.) I think I have to try them this weekend. All looks so delicious. And it has a gluten free option, means it can have a variety of health benefits, such as improving cholesterol levels, promoting digestive health, and increasing energy levels. I get notifications from your facebook page and Fat, Sick & Nearly Dead’s. Imagine my surprise when I see a recipe from you on FSND’s page. I’m so happy they’ve recognized your blog and all the delicious, healthy recipes. Wow, so many bars to chose from! Pinned nearly all of them, will have to reference this page throughout the year for ideas!! I am allergic to nuts and wouldn’t eat any of these. The author is obviously not allergic herself or likes to live life on the edge if she is…. Awesome. These will be great for taking with me to work. I wait tables and low blood sugar is a frequent issue. I was wondering if it would be possible for you to title your posts with the foods, not just your blog name. It would make it easier for me to file and retrieve the posts when I have a chance to try any of the recipes. As it is now, I have to forward the posts to myself with my own recipe titles. I think others might appreciate knowing what is contained in the posts when received as well. I’ve just made some Present Glo Bars and for some reason went and wrapped them in parchment and twine instead of simply using plastic wrap or foil – way to make things time consuming! I assume they’ll still keep alright like this? I’ve got them in a sealed container in the fridge. I would pop 3 or 4 in a ziploc bag as well and then put them in the container. I’m not sure they would last too long on their own in the container. As a busy mom of two kids and one newborn not always can’t find a time to make something especially snacks to go. Although, healthy nutrition for my kids comes as one of the first things. I was more than happy to discover Chomps Snack Sticks(http://www.gochomps.com/)- 100% grass fed beef, gluten free without any junks in it– very importants facts. My kids are very happy and so do I. My family LOVES these recipes. Our favorite is the Roasted Chickpeas. I’ll usually toss some in a my son’s lunch box for a school snack. He also love Kinder Surprise Eggs which are surprisingly not all that bad for him. Great post just wanted to let you know. Much needed for our kids. This blog is great. I work with seniors who often do not realize how healthily they can eat. Eating doesn’t have to boring when you choose to eat healthy as this blog has shown! I’m really worried about the nut free claim. Our schools say peanut free but what does that really mean? My friend says she has a life threatening ‘peanut’ allergy but she is deathly allergic to all nuts including coconuts, sunflower seeds, pumpkin seeds, sesame, pine nuts, you name it! Technically I could send whatever I want to school so long as it doesn’t have peanuts in it but I wouldn’t feel good about it. Milk is another deadly allergy protein nobody cares much about in schools those I’m sure there are many others. By the way, people trying to get hypoallergenic snacks on planes say that epi pens only last 10 minutes, not long enough to land just enough for a ground ambulance with no traffic. Very expensive to carry 10 or more epi pens at 100 a piece. Anyways, when people say peanut allergies they usually mean most seeds and nuts and can include coconuts ect. Hi Angela! I am inspired by this post very much in search for appropriate snacks I can pack for my 13 month old to daycare. As much as I would like to make everything on this post, can you help me narrow down to 1-2 to start? I need something soft(er) for my 13 month old. Thank you so much for the guidance! Your recipes look great! My daughter is allergic to all nuts. I notice quite a few of the recipes have coconut oil or some form of coconut. Any substitutions for that? Coconut is a nut, so anyone with nut allergies across the board can’t eat coconut. Hey Anne, Thank you! As for swapping coconut products, it really depends on the recipe. If you have any specific ones in mind I’d be happy to help troubleshoot! And a note about coconut: In Canada, coconut is not considered a nut product as Health Canada classifies coconut as a “seed of a fruit” and not as a tree nut, however the U.S. FDA classifies coconut as a tree nut, so as you can see there is some confusion over classification when it comes to coconut. Since I live in Canada I use Health Canada’s designation in my recipes.